Chatteris' own Charlotte Bland on why Lamma Island is the perfect place to spend a lazy day. 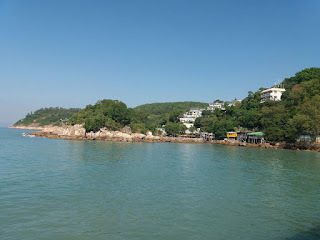 I’ve been to Lamma Island repeatedly in the few short months I’ve been living in Hong Kong and I honestly can’t envisage myself falling out of love with it anytime soon. 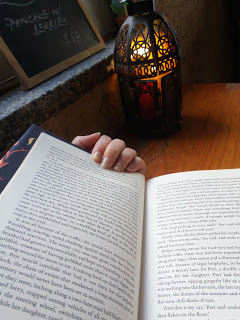 The food, the eclectic shops, the beautiful beaches and just the general laid-back vibe is bound to get you hooked. 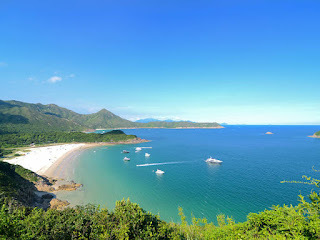 From temples and hiking trails to beach-front bars, Lamma has something for everyone. Getting there is a breeze, so you’ve no excuse not to visit. Head to Central MTR station and take exit A. 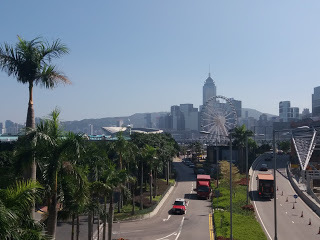 From there, a quick 5 minute walk across a footbridge takes you straight to Central Pier 4, where ferries for both sides of Lamma Island depart from. It only takes 20 minutes to get to the ‘main town’ Yung Shue Wan (the area of Lamma I’ll be talking about in this post) and around 40 minutes to get to Sok Kwu Wan. The latter is the quieter, fishing village part of the island and the ferries run more infrequently. No cash is needed to board the ferries- tap in with your Octopus card and you’re good to go! It’s cheap to travel to considering it only costs HK$17.8 each way and the journey is pleasant, even for someone like me who gets super sea sick (shout out to everyone stuck on a boat with me during the fateful Macau trip saga). Above: Not the worst view from the footbridge. A 15-20 minute scenic stroll brings you to the beach. It’s always clean, never seems too crowded or noisy and big beach mats can be purchased for just a few dollars from one of the many little shops that line the path down to the beach. It’s a great location to Skype your parents from to gloat about the hot weather whilst they are back in frostbitten England, scraping ice off their cars. Scarecrow: Situated on the main street, it’s run by a lovely local lady who sells beautiful hand-made gifts like purses, bags and little boxes. I grabbed myself a keyring for $18 and there were lots of different designs to choose from. 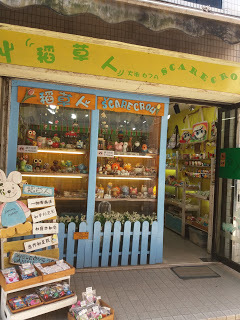 This would be good place for cheap but thoughtful Christmas gifts to send back home. 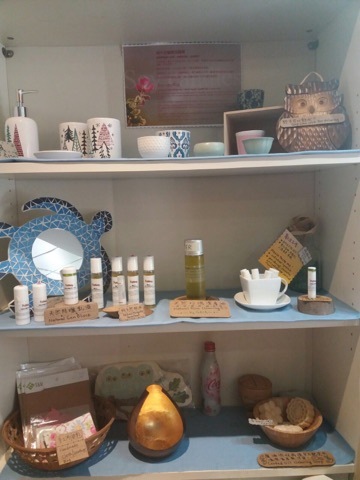 Lamma Corner: This ethical shop is really into upcycling with many of their products made from recycled materials. They sell interesting old postcards of the island, some stunning wildlife photos and books galore. The candles don’t have any horrible chemicals in them and they smell pretty amazing! If I could cover my flat in these I would but I’m A) not a millionaire and B) cannot be trusted around flames, as my flatmates well know. Nevertheless, the thing that caught my eye the most, being the skincare junkie that I am, was their range of natural skincare products nestled away in the corner. I was lured in by a half price offer on a huge Rose Cleansing Oil ($44) which I’m praying will sort out my stressed skin and spare my poor mum an extortionate shipping fee sending my UK skincare over. Something About Cats: You’ve guessed it, this shop is full of pretty much every cat themed item you can think of: cat clocks, cat cushions, cat cards, cat cups, cat canvasses... So much alliteration and SO many cat products. To be honest, I was bitterly disappointed to find that there wasn’t an actual cat that had made the shop its home, but I guess you can’t have everything in life. In sum, if you’re looking for an over-priced cat ice-cube tray, this is the shop for you. You can buy me a cat card to say thank you. Disclaimer: I’m a vegetarian, so the food I’ve eaten here has obviously been lacking a little on the meat front. However, I’ve still had a good look at the different delicacies Lamma has to offer for herbivores and carnivores alike. From pub grub to Indian food, fresh seafood you select yourself to organic everything, you can find it here. 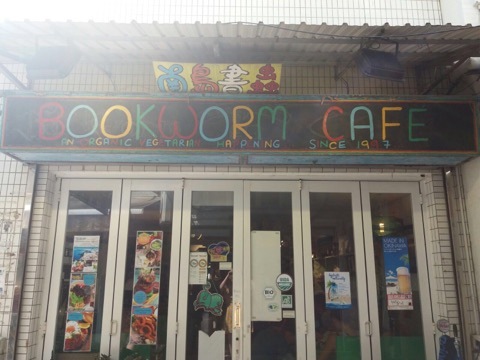 Bookworm Café: A quaint vegetarian restaurant with an absolutely lovely atmosphere, good tunes and prompt service. On my first visit, I had Veggie Calamari (an absolute revelation) and homemade pumpkin and lentil soup. My flatmate had the lasagna which came with a huge salad. Everything tastes really fresh and the prices aren’t too extortionate either. 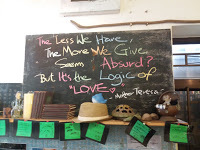 Above: Bookworm Cafe ft. inspirational Mother Teresa chalkboard quote. 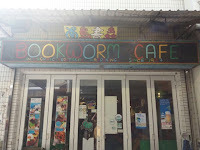 I visited here on my second, leisurely trip to Lamma. 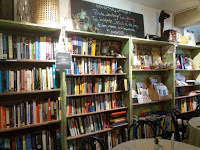 The food was good, menu is extensive (crepes, waffles, fruit bowls) and the breakfast options looked wonderful! The coffee was dreamy and if you’re into your coffees (Caroline), I’m sure you’d appreciate this place. My happiness level hit new heights when I saw the owner go outside and feed the cutest stray dog. Said doggo then proceeded to get braver and braver throughout my meal until he ended up having a tentative wander inside and chilling beside me at my table, eager for affection and more food. Above: Feeling aesthetically pleased in Green Cottage before making a new furry friend. Lamma by night is beyond beautiful. If you can stay to watch the sunset, you definitely should. One of my favourite moments in Hong Kong so far has been looking out at all the lights and little fishing boats bobbing around and making their way back to the shore, bottle of wine in hand. Funnily enough, the ferry ride home was a bit more entertaining after this and my seasickness miraculously vanished. Simply put, Lamma is a world away from Hong Kong, despite only being a short ferry-ride away. If you want to escape the city for a while and swap stress for relaxation and skyscrapers for sandy beaches and stunning scenery, I can’t recommend Lamma enough. Let's Make Some Noise For Those TY Radio Boys!